A source in Mistura’s office said that the UN Envoy for Syria on August 26 will have separate meeting with Russian Foreign Minister Sergei Lavrov and US Secretary of State John Kerry. 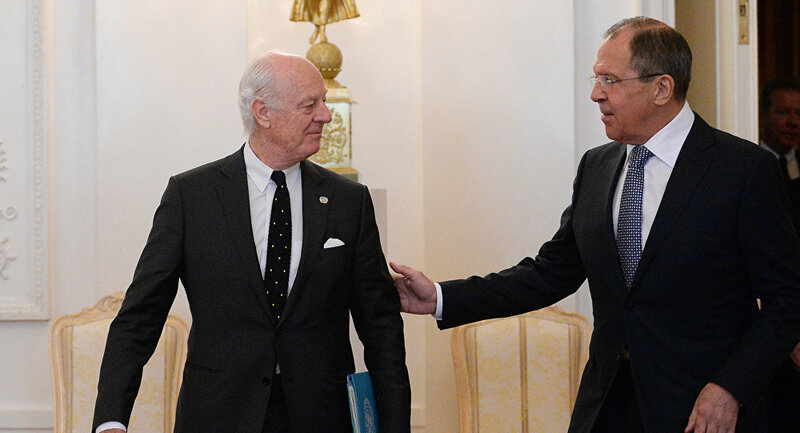 GENEVA (Sputnik) — UN Envoy for Syria Staffan de Mistura on August 26 will have separate meetings with Russian Foreign Minister Sergei Lavrov and US Secretary of State John Kerry to discuss the Syria settlement, a source in de Mistura’s office told Sputnik Thursday. “Staffan de Mistura will have separate meetings with each minister tomorrow. We are agreeing the time at the moment,” the source said. Earlier in the day, de Mistura told reporters that he planned to present Lavrov and Kerry with the UN-led initiatives to get the Syria political process back on track. Also on Friday, Lavrov is expected to meet Kerry in Geneva to discuss issues of Syrian settlement, including the prospects of establishing tight coordination of Russian and US actions in the fight against terrorist groups operating in Syria. According to diplomatic sources close to the talks, the upcoming Lavrov-Kerry meeting was preceded by expert military-to-military consultations Tuesday on joint work to organize humanitarian pauses in Aleppo and to ensure the safety of humanitarian convoys travelling to the city. While Syria has been mired in civil war since 2011, with government forces loyal to President Bashar Assad fighting a number of opposition factions and extremist groups, Aleppo has seen intense fighting over the past few months with the Syrian army and local militia forces managing to encircle large groups of militants in eastern districts of the city.